manage many various injuries, such as fractures and even bleeding. Triangular bandages is a standard for most first aid kits because it can be utilized in different ways to help treat and manage many various injuries, such as fractures and bleeding. Moreover, they can also be used as slings to support a limb or safeguard a dressing in place. It is called a triangular bandage because the bandage is put into a right-angled triangle. Triangular bandages are also called cravat bandages. Triangular bandages do not require many materials to be created. It is easy to make and is found in most first aid kits. Another advantage of making use of a triangular bandage is that it can be makeshift from many materials found at home, and in most cases, even in the wilderness. The following are common materials needed to make triangular bandages and improvised materials that can also be used. Stretch out the piece of fabric that will be used. 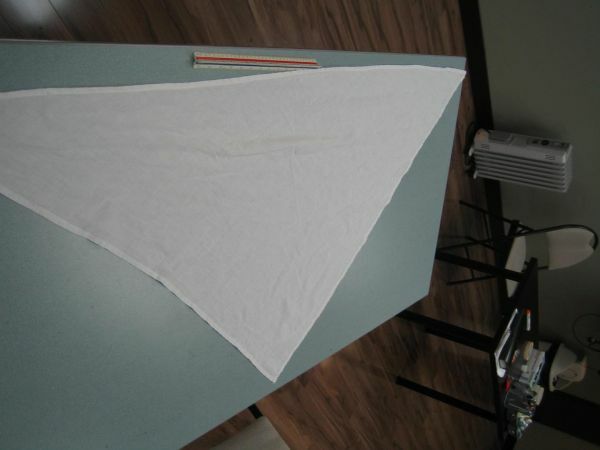 It is preferred to use a long stretch of fabric to create more triangular bandages for future use. Cut the fabric into a square of an estimate 3 feet by 3 feet. Once cut, cut the square in half along the diagonal axis to make two triangles. To sterilize bandages, one may opt to put the bandages in boiling water or soaking it in hydrogen peroxide or any other disinfectant. Allow it to dry before using. Sterilizing will greatly reduce risks of infection. Triangular bandages are generally recommended to be ironed for easier using. Moreover, this will make the triangular bandage easier to store in case of need. Disclaimer: The information from this article does not provide medical advice and should not be substituted for formal training. Seek medical attention when necessary. To learn more about to how to make specific triangular bandages, enrol in First Aid Courses and CPR Courses with St Mark James Training. What is the best material to make the triangular bandages from? Silk is the best material. Very durable especially if you plan to re-use for practice.